Very good condition British George 5th WW1 rifle regiment officer's sword marked and by repute to Irish officer who dies at Ypres in 1917. 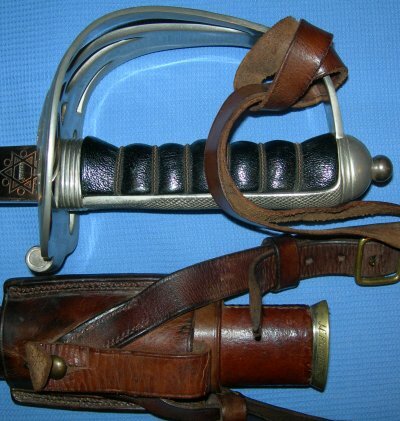 This sword does not look 90 years old but it is; I believe it has been refurbished / replated but incredibly well done if so as the etching is not dulled as with most replated swords. The only reason I suspect it has been replated besides the superb near new condition is one small rust pitting on the blade which clearly has been plated over, plus the grip looks brand new and has a characteristic "lip" associated with later replacement grips (due to the fact they regrip without taking the sword apart). 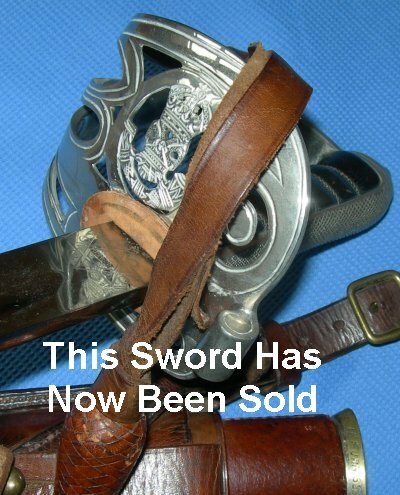 In any event, the sword is authentic and in superb order so as to grace any, repeat any collection. The sword is marked to J.E. Furniss on both the inside of the guard and the scabbard throat and by repute belonged to a James E Furniss, second lieutenant of the 4th battalion of the Royal Irish Rifles who lost his life in the killing fields around Ypres on the 31 July 1917 (see grave record). I understand it remained in his family until they entered it at a specialist sale in 2009.